With the every-day stresses that accompany our daily lives, stress can be a really silent, slow killer. The only way you can escape it is if you are a care-free three-year-old only playing and eating what you want! We, as a society, tend to over-stretch our glutes and back muscles while shortening our pecs and hamstrings, just to be very general. We have forward head posture, which causes Thoracic Outlet Syndrome, which can cause headaches and does cause numbness in our hands. We spend hours at computers working and Facebooking and watching TV or YouTube in awful positions that end up causing us pain or muscle strain. We spend loads of time texting and on our phone and while we are talking about phones, we still try to hold our skinny smart phones between our ear and shoulder while we are talking on it. We get in car accidents, slip on ice, fall down stairs, stub our toes and run into things. And that’s not even getting into the psychological stresses: deadlines, weddings, divorces, kids, no kids, kids sports and activities, church or other volunteer opportunities, pets, significant others, roommates, parents, siblings, extended family, in-laws, job changes, job promotions, new managers, new co-workers, losing jobs, sleep deprivation, sickness, technology not working, phone contracts, internet installation, turning 50, plumbing issues, car work, and the list goes on. 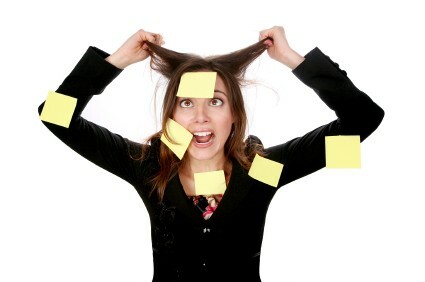 Stress of any kind raises cortisol levels, the stress hormone. Cortisol is good. It’s that feeling you get that lights a fire under you so you do what you need to do. It regulates your metabolism and blood sugar levels; it’s anti-inflammatory and helps with memory storage in your brain; it regulates your blood pressure. So you can’t just remove it from your body and call it good. If you were to do that, you would have all sorts of other bad symptoms. Too much cortisol can lead to high blood pressure, osteoporosis, weight gain, mood swings, and muscle weakness.